Chris Davis' baseball nightmare is over. 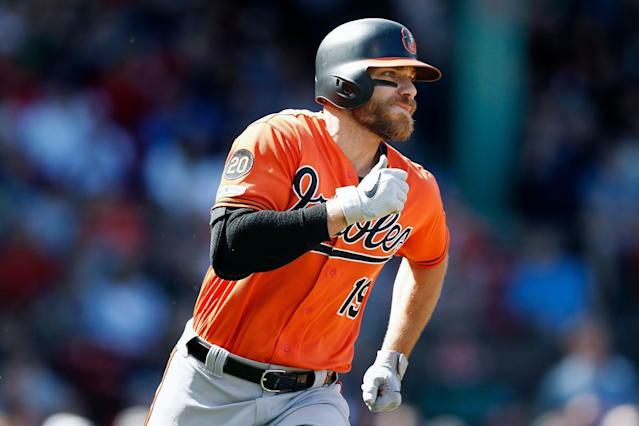 The struggling Baltimore Orioles slugger finally snapped out of historic slump on Saturday, collecting three hits in their 9-5 win against the Boston Red Sox. The first hit was an especially big one for Davis. He entered hitless over his past 54 at-bats, which was the longest ever for an MLB position player. It came in a big spot, too. Baltimore had loaded the bases with two outs in the first inning aganst Rick Porcello when Davis roped a two-run single just over Boston’s shifting infielders. It was Davis’ first hit since Sept. 14, 2018, when he doubled against the Chicago White Sox. Davis finished that season on an 0-for-21 slide. The stretch capped a dreadful season that saw Davis finish with a .168 batting average. That was the worst batting average among qualified hitters in MLB history. This season was somehow off to a worse start. Davis was hitless in his first 33 at-bats before coming through on Saturday. Here are a few wild stats that help put Davis’ streak into perspective, courtesy of ESPN Stats and Info. There were 6,997 hits in MLB. 577 different players got a hit (including 57 different pitchers); Madison Bumgarner led all pitchers with 4 hits. The streak-breaking hit led to a big celebration in the Orioles dugout. His teammates even called for the baseball as a keepsake. It will be cause for celebration in Baltimore as well. Davis' hit means free food and booze for Orioles fans who have endured the streak along with Davis. Several Baltimore bars and eateries made that promise before Baltimore headed out to Boston. Perhaps the best news is that Davis hit the ball hard all game long. He followed with two doubles and knocked in two more runs, giving him his best game in nearly two years. Chris Davis broke out in a big way today with 3 hits and 4 RBIs. Davis might never be the hitter who twice led the league in home runs. It’s unlikely he’ll ever live up to the seven-year, $161 million he signed before the 2016 season. But at least Saturday showed us he’s still capable of doing damage.